Dr. Greer will be sharing a Puja ceremony with the group on Friday night. Advanced Intensive on Contact, Remote Viewing and Becoming an Ambassador to the Universe. Offered as a full weekend with Dr. Greer in person- and also as a webinar . Join Dr. Greer at Miracle Springs Resort and Spa in Desert Hot Springs CA, outside of Palm Springs. See below for details of each session. When not in session enjoy the world’s best Natural hot mineral water . Nestled in the foothills just minutes from Joshua Tree National Park, Miracle Hot Springs Resort and Spa overlooks beautiful Palm Springs and the California desert. 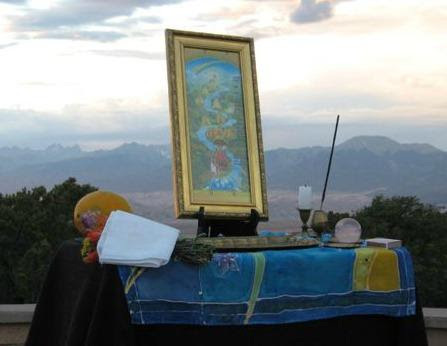 You can practice your remote viewing and meditation while in the courtyard of eight natural hot mineral pools. Discovered centuries ago by Cahuilla Indians, these waters are known worldwide as the very best for therapeutic and health benefits. The price for the in-person presentation is for the whole weekend. Single session admission is not available. There is a special room rate for this group at Miracle Springs which will last until February 7, 2016. -The session will end with an ancient Sanskrit puja and actual meditation instruction including breathing techniques and mantra meditation. – How remote viewing works, and why: understanding the nature of your infinite mind. – Practical techniques for remote viewing that you will learn from Dr. Greer and can use at home. Actual techniques that work will be taught. – Video and stills from the CSETI archives of actual contact with full explanations from Dr. Greer of the lights, sounds, tones and other ET Contact phenomenon. You will be amazed! – Understanding ET Contact and transdimensional phenomenon – materialization, dematerialization, bilocation, thought/technology interfaces, electronic transdimensional ET Contact and more. – How to set up a CE-5 Contact Group and why its important to do so: Mass Consciousness and how it can create a peaceful interstellar future. – Dealing with covert military interference counter-measures and suppression. – The history of interference and how our CE-5 teams have overcome it. – Military stagecraft and abductions – how they work and how to be a mind warrior to transcend them. How to deal with radionics and psychotronics and understanding how they really operate. – The Interstellar Human Future circa 3000 AD -A vision of an entirely new civilization on Earth that is interstellar and rapidly approaching! in person with Dr. Greer ! Click here for webinar tickets. Webinar – watch on Sunday February 21, 2016 – 6- 8 pm or at your convenience. click here for the webinar.